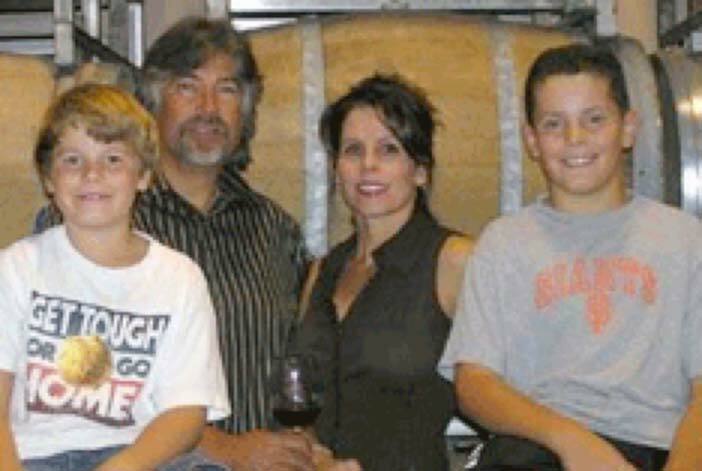 Dennis De La Montanya founded his namesake winery in 2003 and currently farms over 200 acres of vineyards in Sonoma and Lake County. The stylish barn-inspired tasting room and winery is located three miles from the town of Healdsburg, just off Westside Road on Foreman Lane (halfway between Armida and Twomey). The 2007 vintage is the fourth I have tasted from De La Montanya and I often taste each vintage from barrel, shortly after bottling and several months after release. De La Montanya oversees the winemaking team of Tami Collins (sister of Dennis’s spouse, Tina) and consultant Michael Loykasek. For a small winery (production is 4,500 cases annually), De La Montanya produces an astonishing number of different white and red wines (at least 30) under the De La Montanya Estate, Felta Creek and Flying Rooster Red labels from the tried-and-true (Chardonnay, Fume Blanc, Pinot Noir, Zinfandel and Cabernet Sauvignon) to the unusual (Pinot Meunier,Tempranillo). There are wines at every price point. Adding spice to the lineup is a series of “Pin Up” wines featuring attractive women in pin up poses on the front label that are sold at the winery. Special charity bottlings are offered in conjunction with rock legends Journey and Eddie Money. The Pinot Noirs are sourced primarily from three vineyards: Flying Rooster Ranch in the Petaluma area of the Sonoma Coast, Tina’s Vineyard in the Russian River Valley and Christine’s Vineyard in the Sonoma Coast. 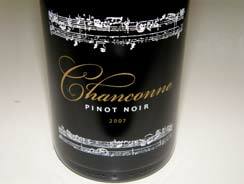 An ultra-premium Pinot Noir, Chanconne, is bottled under the De La Cain label and is a collaboration between De La Montanya and noted Aussie winemaker Daryl Groom. The Pinot Noirs have been consistent winners in the San Francisco Chronicle Wine Competition and the Sonoma Harvest Fair Wine Competition. At the 2009 Pig and Pinot event in Healdsburg, the 2006 De La Montanya Reserve Pinot Noir was the Pinot Cup Runner Up in a blind tasting of 50 acclaimed Pinot Noirs. Just before Pinot Days I stopped in at De La Montanya to taste the 2007 lineup of Pinot Noirs. The style is understated and elegant with increasing fruit intensity as one progresses from Tina’s Vineyard to the Reserve and Chanconne. De La Montanya describes 2007 as a challenging year but the wines are very impressive. 13.6% alc., 74 cases, $32. A unique combination of 70% Pinot Noir and 30% Pinot Meunier. · A fruity nose leads to slightly tart flavors of red cherries, herbs and leaf. Light in weight and a decent quaffer. 14.2% alc., 150 cases, $24. Sourced from Flying Rooster Ranch and Marg’s Vineyard. · A lightly weighted wine that is true to the varietal with dark red fruits supported by a sidecar of oak and good acidity. The silky texture makes for easy drinking. Excellent value in a Pinot Noir for the everyday man. Gold Medal at the 2009 San Francisco Chronicle Wine Competition in its class. 14.4% alc., $45. Dijon clones. · Darker fruit and more intensity than the Tina’s with tasty notes of cola, savory herbs and blueberries. Soft and smooth in the mouth with a finish that goes on and on. 14.4% alc., $40. Pommard clone. · Very fragrant nose of Bing cherries and baking spices. Generous sweet Pinot flavors on the mid-palate focused on cherries. Very harmonious with svelte tannins and a good grip of acidity. Always the most finesse in the lineup, this is a wine of slender grace. 14.2% alc., 50 cases, $50. This wine received 3 more months of barrel age. Composed primarily of fruit from Tina’s Vineyard with some Ridgeway Vineyard added in. Only two barrels, 100% new French oak. · Masses of perfumed fruit on the nose with a sappy aromatic core that is plush but retains a pleasing elegance. Supple tannins, deft touch of oak and lively acidity. The berry fruit fragrance returns to haunt the memorable finish. 14.2% alc., 75 cases, $50. Chanconne means slow dance in French. Sourced from 3 vineyards. · Aromas of super ripe fruit including roasted plum and black raspberries, with hints of maple syrup and cigar box. Explosion of intense, ripe dark fruit attacks the mid-palate with undertones of black tea and sassafras. Smoothly textured with modest tannins and admirable balance. A big-boned wine for hedonists that veers to the super ripe side. 14.2% alc., $22. A blend of Pinot Noir (75%) and Cabernet Sauvignon, Cabernet Franc and Petite Verdot. · Rich and plush with hardy fruit, a nice kiss of oak and some persistence on the finish. Not for Pinot Noir purists, but a great inexpensive summer barbecue wine. Dennis loves to taste me on some of his other varietal wines. The 2007 De La Montanya ‘1776’ Dry Creek Valley Zinfandel is the most popular wine in his lineup. With 17.76% alcohol and 1% residual sugar, it offers a huge jammy drinking experience with well-spiced fruit dosed with pepper. I much preferred the 2007 De La Montanya Reserve Dry Creek Valley Zinfandel ($45) with 16.5% alcohol and 0.5% residual sugar that is better balanced, more modest in intensity and offering classic Zinfandel black grape flavors with a touch of pepper. I recently tasted two older vintages of De La Montanya Pinot Noir from Tina’s Vineyard. The wines are holding up beautifully. 14.0% alc.. 75% Pommard, 25% Dijon clones. Aged 11 months in French oak barrels. · Moderately light garnet color. Alluring aromas of cherries, baking spice and oak. Sweet-fruited palate of strawberries, cherries and pomegranate with bright acidity. A touch richer than the 2005 vintage with more fruit and less spice. A nice package with admirable finesse. 14.4% alc., $32. · Shy perfume of red cherries and Provencal herbs. Nicely composed flavors of tart cherries, strawberries, baking spice, cookie dough and herbs. The tannins are very supple and the finish has a good lift of acidity. A demure wine with considerable charm that is aging gracefully. The De La Montanya tasting room is open Friday-Sunday 11:00 AM to 5:00 PM and other days by appointment. The wines are sold through the tasting room, on the website, and through the winery’s wine clubs which offer significant discounts. The winery is a soothing place to hang out with a bocce ball court and picnic area shaded by mature apple trees. An adjacent lodging known as the “Little Yellow Cottage,” has all the comforts of home and overlooks the Felta Creek Vineyard on the property. It is only a 10 minute drive to Healdsburg and bicycling distance to many Westside Road wineries. Check the website at www.dlmwine.com to order wines and to check availability of the cottage. The De La Montanya crew below.